This is not so much a recipe as an idea. It's easy to do and does impress – even if you are using canned soup. 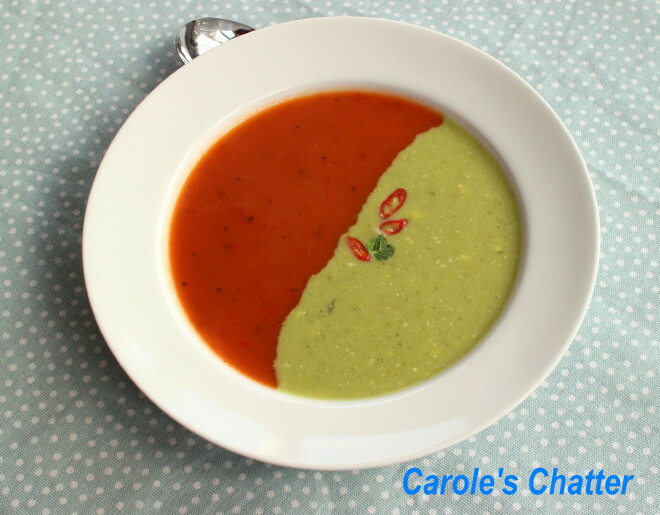 The 2 soups I used were a pea and rocket soup and a tomato and capsicum soup. I picked them for their contrasting colours. And the flavours complemented each other too. When I do this again I will use frozen peas to make my own pea soup to try to get a really vivid green colour. All you do is heat up your soups – separate pots, of course. Then pour each into a jug and then pour from both jugs at the same time and about the same rate but from opposite sides of your soup plate – and that's it.